Do you need help making the map for your quilt? I would be glad to lay it for you. Note - design help is for those exclusively following the directions in our book. If you are not using the book for your directions, we cannot be of help. Send a check or money order and a copy of your counting chart to us. Upon receipt of your request, I will either e-mail you a copy of your map or send it via the mail. Please let me know which you prefer. Be sure to include your mailing address or e-mail address with your request. 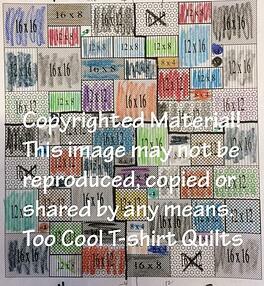 Copyright © 2019 Too Cool T-shirt Quilts International LLC. All Rights Reserved.